There are certain behaviors and topics that get me overly excited or irritated. Respect or lack there of is a big one with me. Normally I can ignore most things, but last weekend my family and I went shopping in the capital city of our state. I don't know if everyone in the particular store had woken up on the wrong side of the bed or what, but everyone was rude. One women went so far as to push me in the checkout line and then rudely tell my oldest son 'excuse me'. This is a store which is a national chain and we shop at the location near our house frequently. At the location near us people are always friendly, but not this location. And I'm sorry to say it hasn't been just one time, it's every single time we shop at this location. I think people in this store location have had a little too much caffeine or lack thereof. It's funny how geography can make personalities completely different. By the time I leave the store I seem to be far less friendly and a lot more angry. When I get stressed, or angry, or just because, I tend to make breakfast foods. I love breakfast foods, there is something so comforting about eating a big plate of waffles or pancakes. Last week I tried a new recipe for French Toast from the Food Network. This recipe has 9 ingredients. It takes 30 minutes of total time, all of which is active and makes 4 servings. I only changed a few details from the original recipe. First, I used homemade challah bread (leftover from my giveaway). Second, I served the French toast with butter, not maple syrup. My youngest refuses to eat maple syrup, so I used butter and powdered sugar instead. Finally, I increase the amount of vanilla to a teaspoon and added a slight bit more of nutmeg. This French toast turned out really well. It browned beautifully on the griddle and my youngest loved it so much that he ate 4 pieces as soon as it was done. I froze the leftovers and they re-heated well in the microwave (or you can use a toaster oven) for a quick weekday breakfast. This recipe would also work well for a brunch party or a holiday since it looks so nice on the plate and you could make big batches at once and keep them warm in the oven. For the recipe go to French Toast. Thanks :) It turned out really well! It sounds really good. I don't usually like French toast all that much because I'm not a egg person but sometimes it's just the thing. I'm not much of an egg person either. Every once in a while they hit the spot though! Sorry that you haven't been feeling well :( I always have a horrible time with surgeries, I hope you start feeling better soon. I live in the Boston area and people around here are notorious for not being so nice, but if someone pushed me in the checkout line, they would have gotten pushed back by me for sure. Thanks :) I love breakfast foods too! These look delicious. There are some breakfast foods I'm up for anytime too. :) Sorry you had to encounter getting pushed at the store, oy! I love certain breakfast foods all day too, especially pancakes! 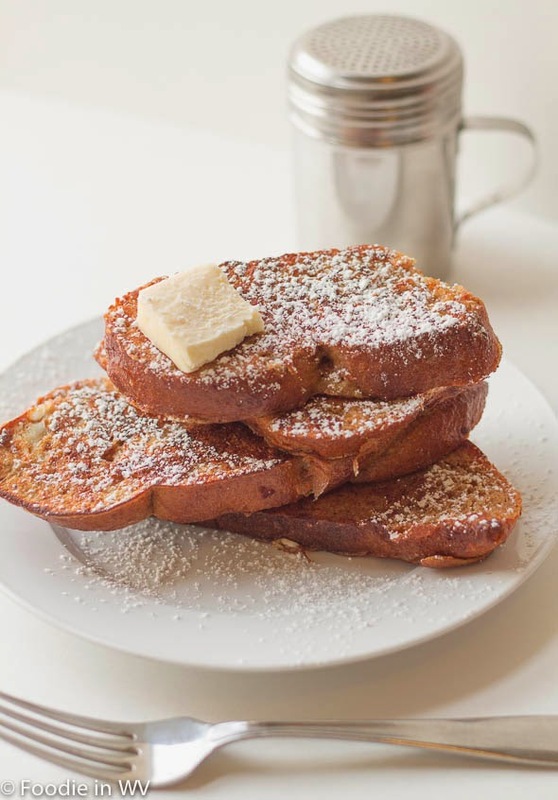 There is nothing better than good French toast. My kids like it with butter and powdered sugar too. I like it with syrup and bacon on the side. I like it when a little syrup gets on the bacon! Thanks for sharing. My husband likes it with bacon too! 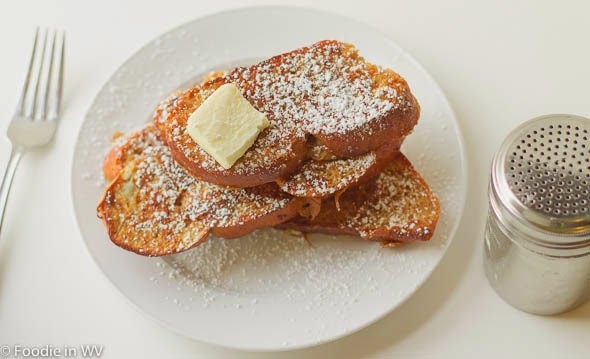 I am salivating terribly...your French toast look simply irresistible! Thanks :) It was popular with my kids! 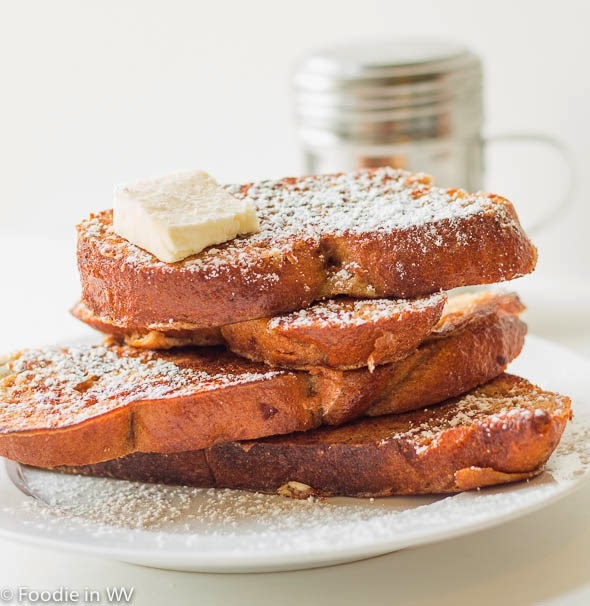 The Banana Foster French Toast recipe I posted calls for challah bread or egg bread. I really need to find this...but the only place I know of is Amazon. Thanks for sharing!